Fender Princeton Reverb Amp Combo tubi come nuovo-perfettamente poco. The Fender '65 Princeton Reverb Lacquered Tweed electric guitar tube combo amplifier is unique! The speaker has been beefed up to a 12" Eminence Cannabis Rex for its blend of smoothness and sparkle. The Fender '65 Princeton Reverb Amp is an authentic all-tube reproduction of the original classic! '65 Fender `Princeton Reverb. Great condition. Effects: Reverb, Vibrato. Tubes: 3 x 12AX7, 1 x 12AT7, 2 x Groove Tubes 6V6, 1 x 5AR4 rectifier tube. Princeton Reverb decal, Princeton Reverb badge, Princeton decal, Princeton badge. Fender 65 Princeton Reverb Reissue Printed Circuit Board PCB set. These are being sold as is but should be fully functional. Multiples for sale so image is not of actual item. Reverb - 8 3/4". This is for (1) face plate. Treble - 5 1/4". 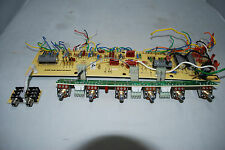 Fender 68 Princeton Reverb Reissue Printed Circuit Board PCB set. These are being sold as is but should be fully functional. 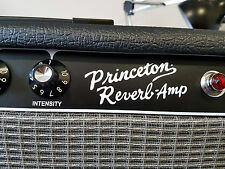 There is an unused power node in the Princeton that many think Fender did on purpose so it would not compete directly with its big brother Deluxe Reverb. This dulls the sound fed into the power tubes and doesn't fully allow the amp to shine it's perfect tonal light to the world. 5U4GB (1) - USA. Next we computer match the preamp tubes for consistent tonal reproduction. Princeton Reverb. ULTIMO Tube Sets. Unlike any of our competitors we also buy back your old tubes (see details below) so you get an even better overall net price on our new tube sets. Tube Complement for Fender Princeton Reverb II JJ/Tesla Brand includes: (1) T-6V6-S-JJ-MP (Apex Matched), which includes: (2) T-6V6-S-JJ (1) T-12AT7-JJ (3) T-12AX7-S-JJ . Also the AB868 and AB1270 had a 5U4GB. Princeton Reverb (AA 1 64 AB868, AB 1270 with 5U4GB). Fender Princeton REverb Primo Tube Set 6V6 (2) USA 5U4GB (AA1164). 5U4GB (1) - USA Made. PRIMO (higher rated tubes and still good value) tube set. Fender Princeton Reverb AA1163 GZ34 Tube Amplifier schematic. This schematic is in form of electronic file, PDF format, black and white, 2 pages, size - 1.8Mb. Contains electronic diagram and parts values. For Sale: One new black tolex top back panel to fit Fender Blackface Princeton Reverb Amp. Will also fit early Silverface models up to '74. This panel is 18 - 1/4". This panel is made from the finest 5 ply, Cabinet Grade, 1/4" Baltic Birch plywood for strength and straightness. This amp cover is a genuine Fender cover for a Princeton 65 Reverb amp. It is a black nylon fabric with an embroidered logo, heavy duty seams and an opening for the handle on top. Model number 0075947000. This Recap Kit includes full-color, easy to follow instructions and the following parts INQUIRE FOR CUSTOM RECAP KITS . Fender 65’ Princeton Reverb black nylon amp cover. This item is described to the best of my ability, and is sold as is. Black nylon cover designed to fit '65 Princeton Reverb Reissue amplifier. NEW - GENUINE FENDER AMP COVER. Other alphabets (Cyrillic, Japanese, Chinese, etc.) will not be translated and your item will be delayed. FREE Trial! From Hiroshima, Far east island Japan!